There is no easy way to get to Gibraltar from New York City. The options are limited, you can fly through Manchester and London but with an overnight stay in the UK or through Madrid and Barcelona with connections into either Malaga, Spain or Trains into Algeciras, Spain. Don’t try going through Lisbon, it is horribly expensive and was our last resort. Flying on standby with a Pilot has its perks. First, you know a ton of people at the airport so check in can be pretty quick, second, you can by pass security lines and go through the crew line, third, your carry on luggage can be almost double the size of a normal passenger although I was told “duffel bags” only! (So you can stuff them into the overhead compartments!) fourth, you can punch in a code and get behinds the unmarked doors in the terminal, where you can watch the news, look at the weather and “check the loads” on the computers, pretty cool! We put ourselves on stand by for a flight to Lisbon and Barcelona, Barcelona being the first choice. As luck would have it, we knew someone at the check in desk and sure enough, 2 tickets emergency row to Barcelona! We were ON SCHEDULE. Travel Tip: Make sure if you get a choice of the Emergency Row to take the second row of the two rows because these seats recline! 7 1/2 hours to Barcelona and we caught our connection to Malaga with Vueling Airlines. Vueling has flights that connect all over Europe from either Madrid or Barcelona, for about 55 Euros we flew to Malaga, Spain and about an hour later we arrived on time and on schedule in Malaga. The twisty windy A-7 through the Costa del Sol it a ton of fun. It is arid here. The blue sea to your left and mountains on your right, you wiz through towns after town of vacation beach communities… There was an enormous construction boom here over the past decade and in the Costa del Sol alone they have an enormous inventory of homes on the market to sell. In a push to sell these units, there are apartments up to 40% off their original value. About an hour and 15 minutes later, we take a sharp turn on the top of a large hill and behold, the Rock of Gibraltar in the distance. It sits sternly but peacefully at the mouth of the Mediterranean Sea. North Africa is slightly visible as a backdrop, quite a sight and a bit surreal. Population: 30,000, Country: Colony of the Great Britain, Currency: Gibraltar Pounds, Reason People are even here: TAX HAVEN! We were lucky, it can take a few hours on busy days to get through, for us, just about 20 minutes. 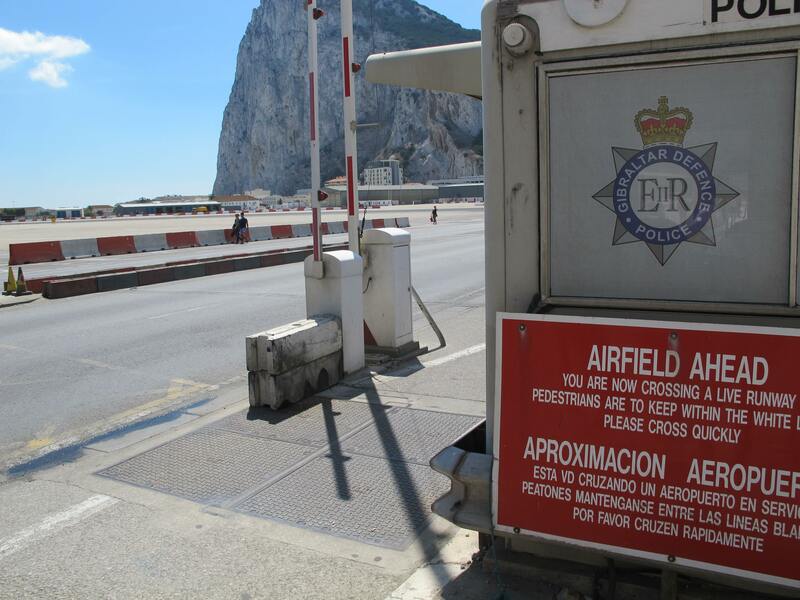 i have heard that up to 60,000 people commute to Gibraltar daily from work from Spain. A few minutes driving and we took a right hand turn into Queensway Marina… 18 hours later “door to door” we threw our duffel bags on the boat. We were here. 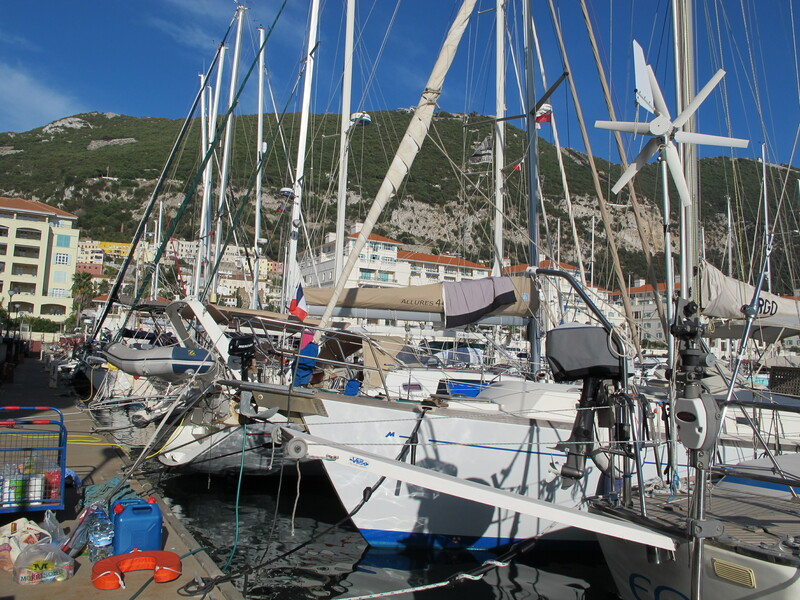 The Boats are from all over, from Norway to France to the UK – sailors are either on their way in or out of the Mediterranean. After a morning of tinkering on the sail boat and hungry for lunch, we drive up to the famous Rock Hotel, that has spectacular views of the port. 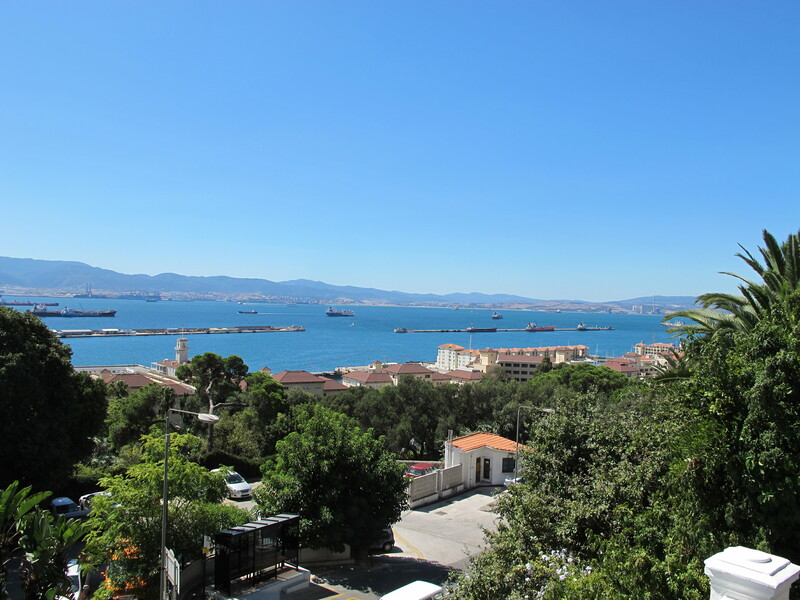 Algeciras, La Linea and Gibraltar surround an enormous industrial port. Hundreds of cargo ships enter weekly and you can count 30 just sitting in the harbor as I write. It’s the first stop into the Mediterranean and last stop out to the Atlantic. The Rock Hotel has an spectacular view overlooking the port and is a perfect setting for a first day’s lunch. Built in the year 1932, this old world hotel sits a on the cliffs of the West side of the rock. It enjoys spectacular sunsets, has a range of gorgeous gardens, tea rooms, restaurants and parlors. Rock Hotel has a feel of English Royalty but with time passed. Its marble floors and oil paintings prove to be a beautiful setting and a must see. In Gibraltar you drive on the “right” side of the road, not the left, all the street signs are in English, currency is in Gibraltar Bank Notes, although Euros and Sterling are accepted. The news here is that they just introduced the new Gibraltar Bank Notes and sure enough, the Queen’s mug shot is printed on each bill. The British Flag hangs high on many homes, buildings and outside apartment windows. There are Policemen or “Bobbies” patrolling the streets, English Pubs, and the people, especially men, could be cast in any Guy Ritchie movie. They all have buzz cuts, weathered red faces and tattoos and speak with local English accents that are rough and tough. I don’t see too many people smiling… Along with that, you have an enormous Spanish/Andalusian and a large Morrocan population. Catholic is the majority religion but the area itself is enormously diverse. We met Gemma, a local GIBRALTARIAN who has just returned from studying in the UK. She is 100% English, and tells us there are 29,000 people that are considered local Gibraltarians. Even though a large foreign population, growing up here can be quite isolated. There are just 2 high schools and it is an English based system. If your grades suffice, college education is complementary of the Queen. Gibraltarians, however need work permits to live and work in the UK and many of them, if they study in the UK, do come home. Gemma loves the weather here stating, “it is much better than back in the UK”. The local architecture includes what look like Roman ruins, Morrocan style homes, Soviet public housing, Brazilian Favelas, English style Tudor homes and Miami Beach like high rises… it is an eclectic mix of architecture to say the least, although I am finding beauty here, I don’t think it would be considered the most beautiful area in Europe… still there is an quirky charm here that begins to grow on you as you begin to feel the tempo of area. There are 2 parts to the rock, the old city that sits behind a large wall with gates and the new side of the Rock filled of new construction, dockside shops and grocery stores. The old side with its typical square like European style village and the new side with bayside shops and restaurants, that reminds me of Miami… and yes, there is a McDonalds and a Kentucky Friday Chicken… GO figure. They have been building out into the Port as much of the area that has all the new architecture is fill. The original city stood close to the dramatic rise of the Limestone rock, as people moved in and demand for space and housing grew, they have moved fill into the port and land around the rock continues to grow. The Calata Hotel sits on the East Side of the rock, under a dramatic vertical drop – considered the sharp side. 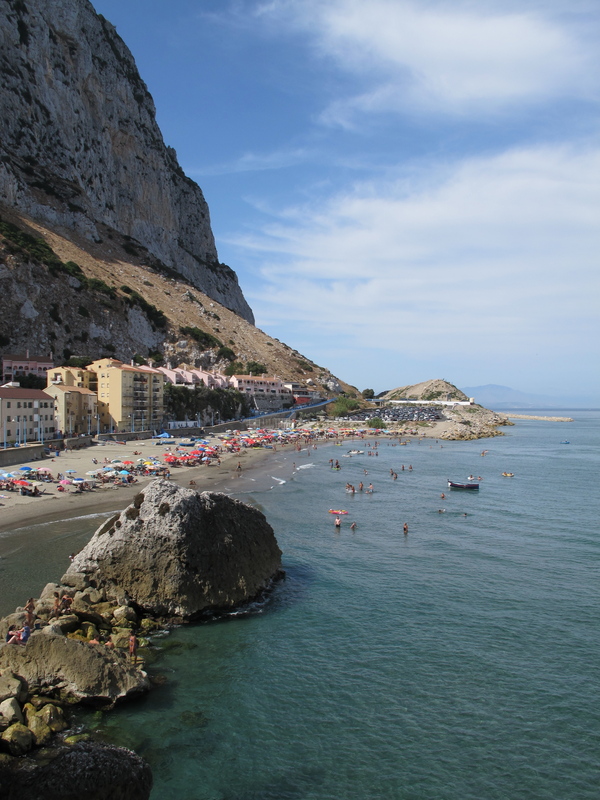 High above are the white sided mountains that we are set to climb in a few days, but today, we decide to stay in vacation mode and have a beach day in Catalan Bay. The Calata Hotel is much like the other hotels, built in the hay day, there is an old world richness that exudes from these walls. Hotel staff fervently set up for more weddings, and it restaurants and pools sit cliff side looking towards the east. There are various, levels of gardens, parlors, restaurants, pools and sitting areas that over look the public beach of Catalan Bay. The food here is ok. Not amazing. No to offend the English, I find it is difficult to get really good seafood, and decide to dine on Scottish lochs, still the service by a Spaniard and an Argentine was good and the setting lovely. After lunch a walk to the beach, which has almost blackish sand. Purple and pink and brown shells. The water is clean and cold as it ripples onto the shore. Easy wading, there is an energy here mostly enjoyed by locals. When the locals beach here, they bring an entire set up which include card tables, coolers, chairs, blankets, carts, games toys and umbrellas. They camp for the entire day as kids collect delightful shells. There is no undercurrent nor big waves… so it is a very relaxed atmosphere. There are cottages that dot the beach side under the dramatic cliffs of the Rock in all colors. As the sun dips behind it, we decide to chase it around to the other side of the rock where it then sits high above once again. 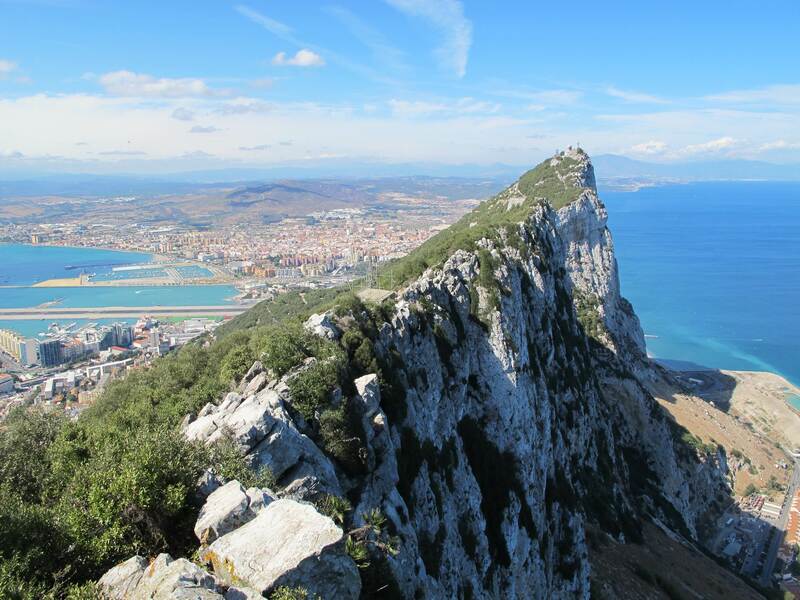 It takes about 20 minutes to drive around the entire rock of Gibraltar. Maybe 25 minutes, maybe 15. It is hard to tell and depends on traffic. 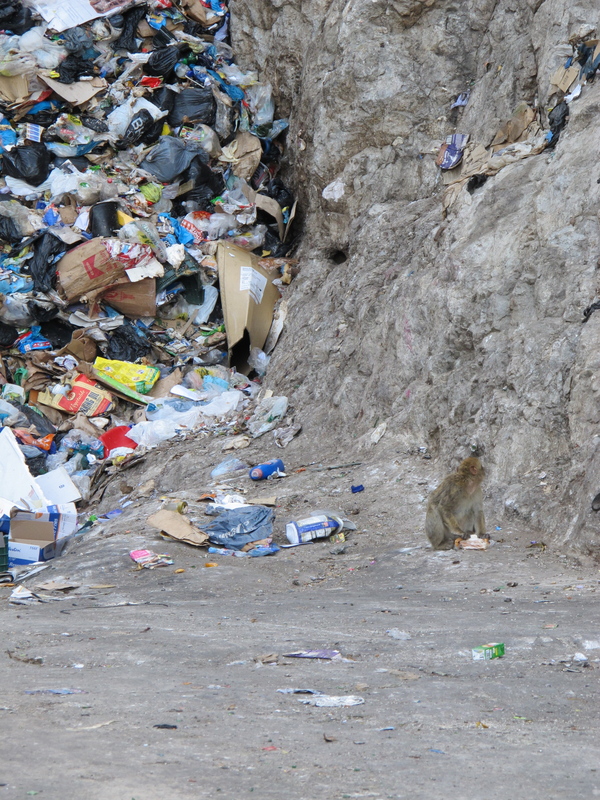 We head south and find the dump, where monkeys are picking through trash almost like people. One monkey limps as it has an infected foot, and we wonder how long he will last. They are tail less and there are about 150 of them living on top of Gibraltar. We will see them on our climb. Rumor has it they will steal your purse and pick through it, so purses are not encouraged. You always forget that your garbage has to go somewhere, seeing the monkeys pick through it makes me sad… as we drive off. I make a mental note to try to make as little waste as possible. A few hundred meters south we come to the southern most tip of the rock, where an enormous new mosque sits exquisitely on the cost line with a stellar view of Africa across the way. There is also the Trinity Lighthouse and we are on Europa Point. The road also tunnels through rock, there are tunnels throughout Gibraltar that cut through what it its biggest resource here. Limestone. We make it back to the marina in time for sunset…. Which is around 8:30pm which makes for wonderfully lazy long days. Hope you are all well after that Hurricane in New York. 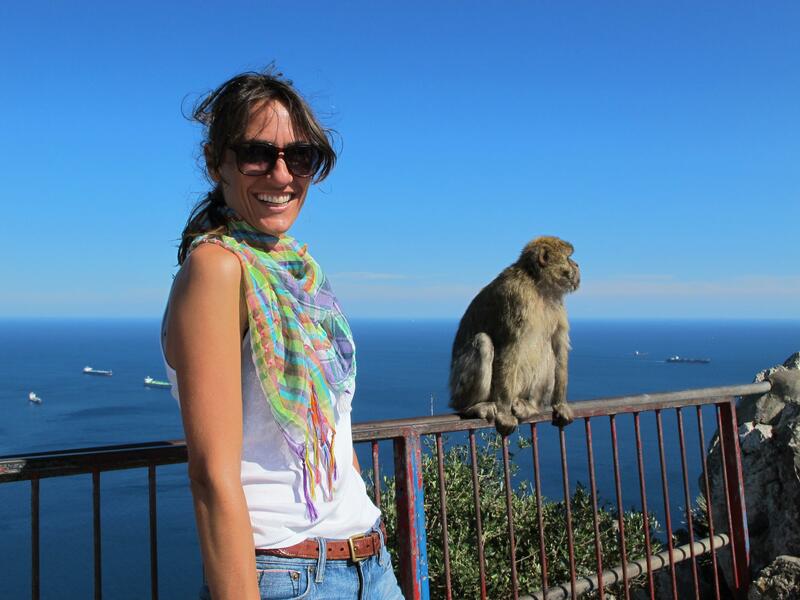 Monkey – ing around in Gibraltar! "I love these little monkeys!" The monkeys are sweet, but then we came across an area where the rock tours come and drive people to the top and throw them carrots. There were dried up carrots on the ground and it was kind of stinky?! Just an observation and I was not too impressed. Still watching them was awesome… Sorry the truth sometimes hurts. Rock tours – should clean up after throwing carrots at the locals (in this case monkeys). The island has about 150 monkeys and they all have names… There are many stories on how the monkeys even got here. You only find species of these tail-less wonders in Morocco and Algeria and on the Rock. Rumors speak of an underground tunnel that they crawled through; other stories are of monkeys carried across by ships for entertainment for the English or as companions to the Arab invaiders… One way or the other they are here to stay somehow protected and somehow exploited, at least there is no fence around them! From every spot you are enticed by views of the Costa del Sol – the Mediterranean – the cargo ships and the continent of Africa. The rock is taller than the empire state building! The Rock from the top of the Rock. We also saw a couple “just married” taking pictures. The wedding mystery is resolved, it is a short flight from Great Britain and the weather is nice and there are plenty of hotels that will accommodate you here. Hence: a wedding outpost for the English! Earlier today I had to also return my rent – car in La Linea, Spain, which is the border town here. As I wrote before 50,000 Spaniards work in Gibraltar that is big in banking and hiding money from the TAX MAN. There is an enormous amount of money here but it is pretty understated in this scruffy town. You see some nice cars but mostly people travel by scooter. As I sit amongst multimillion-dollar condos in the harbor that also feel understated, this transient bank haven community seems oddly down to earth. There are no real high-end shops, clothing or jewelry stores – I guess they can find a Gucci in near by Marbella. In addition the houses are understated and behind walls. The rich keep to themselves it seems and the locals that work the ports and the tourist industry are modest. I can’t say that they are uber friendly and out going – actually I am finding the locals quite reserved… the tax-free folk are in and out of here with not too much Glitz and Glam. Back to La Linea! Another scruffy town! Lots of energy, markets, people crossing into Gibraltar and ugly – which is often times beautiful too… Returning my rent a car, they did not even give me a receipt and it was in some sketchy parking lot, so I called the rent a car place and had them speak with the parking guy to confirm I dropped it! – ALWAYS BE CAREFUL – rent a cars are always a place to screw tourists! 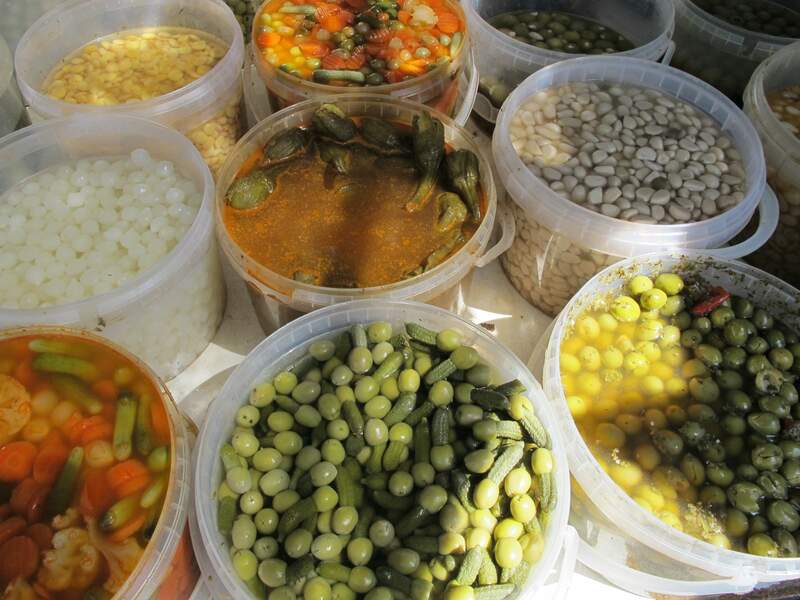 With the car return, I was able to walk around the markets in La Linea and see some locals. Lots of North Africans and Lots of Spanish. Beautiful Black hair and tanned bodies. There was a ton of cheap clothing to buy but in between food vendors. One with delectable pickled vegetables and olives. The olives here are green and MUCH better than the jarred version we get in the USA. I can’t stop eating these dam OLIVES! Walking back over the border you get a real feel for the rock and its visitors. 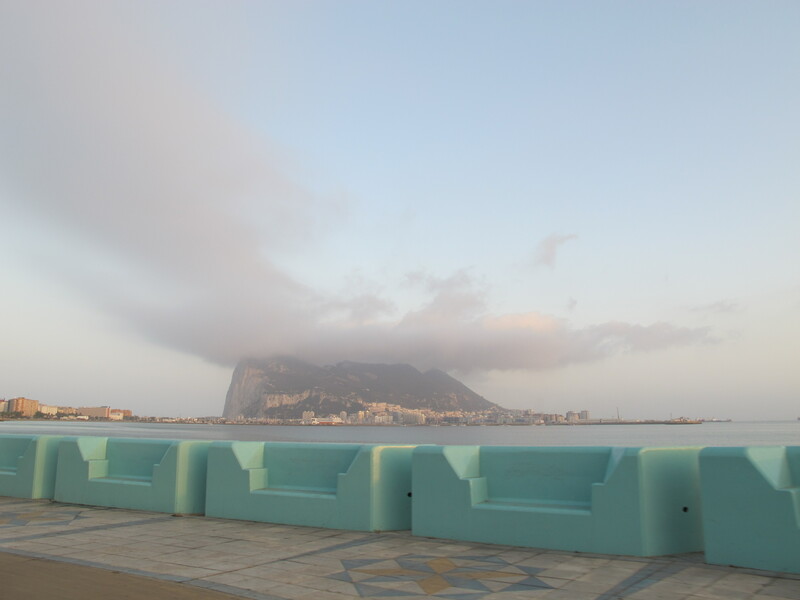 Tons of people stay in nearby La Linea – and walk to Gibraltar for the day. The best part is the airport here. It stops traffice for take off’s and landings… due to lack of land. A new airport terminal and tunnel is being built. Frankly, I think they should stop the tunnel and continue to stop traffic. For just a few moments, the world around the area stops and waits for these jets… people get out of their cars and take pictures… it is actually really cool! Back to Gibraltar – If you are looking for good food, there is one place to go and it is called El Patio. Located in the Piazza you will be greeted by the lovely Manolo. He is Spanish and has been here for a while. The back dining room is filled with bankers for lunch and locals only. The best part is you can still smoke here. (Even thought I don’t smoke anymore, there was something demure about it.) It is funny how the smell of smoke in a restaurant now “reminds you of a time” since living in smoke free New York. So I reminisced for a moment. The cooks are all women and over 70 years old so you know you are getting something good and home made. We dined on baked white asparagus with cheese, olives, manchego cheese, chips, grilled calamari and cod croquettes. The Sangria had a delicious hum to it and we were stuffed in the end. All the fish is local, and all the food is cooked to order. Even the French fries, which were, hand cut. El Patio has all kinds of food but Great for a vegetarian/pescatarian especially if you are stuck with a Carnivore – who will undoubtedly be satisfies with the Spanish style arrangement there. If you go say hello to Manolo! He is such a sweetheart and took great care of us.